Enter for a chance to win the drop shot equipment that Seth Feider used to win at Mille Lacs..from our friends and TinBoat sponsor, Wired2Fish. Smallmouth are always on the move, they can be tough to pattern and can provide a challenge to pinpoint for even the most savvy brown fish anglers. The tools for success are great electronics, precise boat postioning and the best tackle that includes super sharp hooks, great line and the right bait for the job. Keeping the bait in front of the fish and knowing where the big ones live leads to success. Elite Series pro Seth Feider counted on his equipment and knowledge of Mille Lacs smallmouth tendancies put him on top of the leaderboard. For our latest giveaway we are going to give 5 winners the exact set-up that he used for the victory. 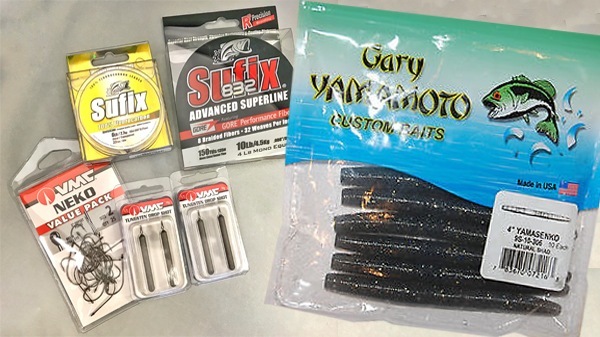 Included in the package is a value package of 25 VMC #2 Neko Hooks, 2 packages of 1/2 ounce VMC cylinder weights, a 33 yard spool of Sufix 6 pound 100% fluorocarbon leader line, a 150 yard spool of 10 pound Sufix 832 Hi-Vis Green braid and a package of Yamamoto 4 inch Natural Shad Senkos. A winning package for catching big smallmouth. This giveaway ends October 18th, 2016. 5 winners. Good luck! Want to stay in-the-know on the latest email news, product info, Pro tips & picks, promotions, special offers and more from Rapala and all of their respected brands? Click here to join their email list.